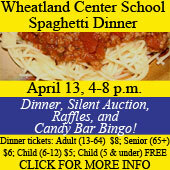 Wheatland Center School’s Annual Spaghetti Dinner and Silent Auction will take place Saturday, April 13, from 4 to 8 p.m. The event, hosted by the Wheatland Center School PTO, will include: Spaghetti dinner (served from 4 to 7 p.m.), silent auction, raffles and Candy Bar Bingo. Dinner Tickets in advance are: Adult (13-64), $8; Senior (65+), $6; Student $5; Child (5 & under), free. Family (2 adults + 2 children) $22 + $3 /extra child. Advance tickets can be purchased here. Dinner Tickets at the door are: Adult (13-64), $10; Senior (65+), $8; Student $5; Child (5 & under), free. Candy Bar Bingo will take place from 5 to 6:30 p.m.
Wheatland Center School is located at 6606 368th Avenue.